I started running in 1978 with my Dad. Growing up in small town Gadsden, I had no opportunity to run XC or track. By 1981 I ran my first marathon in 2:56:35 at age 16, a state record that still stands. At age 21 I ran my first 100 miler. With all that life has to offer, family, raising kids and all of its peaks and valleys, running has always been a focal point for me. Along with my wife Suzanne, Running has been so important to me that we opened Fleet Feet Sports Huntsville 15 years ago. I have made my life revolve around running completely. I have been race director the Mountain Mist 50k Trail Run for the past 24 years, At the time it was the only trail race in Alabama. It started the trail race boom in Alabama and still consider the top trail run in the Southeast. After suffering a stroke (SAH) in the summer of 2012, I decided to participate in my first Tri in 2013. It began in June at Mach Tenn Sprint Tri and ended in Oct with Great Floridian Full distance 140.6 miles despite not having ever swam until Feb 2013. My highlight Tri was at Augusta Ironman 70.3, the largest 70.3 in the world (3500 competitors). With a time of 4:28, it was good enough for 4th in the men's age division 45-49. I was in the top 10 percent in the world age group rankings in 2013, 2014 and 2015 in Triathlon. For my 50th birthday celebration, I did Ironman Chatty(PR 10:44:50) Ironman Louisville, Great Floridian 140.6, Ironman Florida and then ran JFK 50 mile run, all in 9 weeks. I called in the Ironman Slam and birthday run. I grew up a swimmer, competing since age 6 through high school. I started running in 1990 to stay in shape after graduating from college. I started competing in Triathlons in 1993 but mostly just love to train. I completed my first marathon in 1995. I thought I would be one and done but have completed several since with a marathon PR of 3:21. I have run the Boston Marathon 3 times. I have completed the Swim for Hobbs Island 5 mile swim 3 times. Recently I completed 4 Half Ironmans and One Full Ironman. I love training more than racing! I'm looking forward to training with all of you! I have been running on and off for 20 years. I completed my first 5k race at 16. In 2011 I signed up for the Fleet Feet marathon training group. This is just what I needed to jump start my dream of participating in an Ironman. I've always had a passion for triathlons, but never participated in one until 2012. Since, I have completed four full Ironman, six half Ironman races, and many Olympic and sprint distances. I am an ITCA certified triathlon coach. With a family and three boy’s ages ten, twelve, and fourteen; having time to fit in my training can be challenging. It's my enthusiasm and determination that makes everything work. Graduated from East Tennessee State University in 1983. Competitive tennis player as a kid, played tennis at ETSU, was named team captain two seasons. Played professionally for a short period of time. Worked for 18 years as a tennis teaching pro. Road raced motorcycles for 16 seasons, winning a national championship in 2001. Have completed 47 Marathons, 12 Half Ironman races and 6 full Ironman races. Was a member of Team USA for the Duathlon World Championships in Ottawa, Canada.Have been a member of the Fleet Feet Huntsville Triathlon Team for the past 5 seasons. I grew up in Dallas, TX and after a 23-year navy career moved to Huntsville where my family and I have enjoyed living for the last 8 years. I’ve participated in many sports through the years, everything from football, cross country, track, speed skating, cycling to motocross and mountain biking. However, after various injuries side tracked my motocross racing aspirations and as the demands of my navy career increased I fell into some bad habits and became sedentary. Like many today this lead to a lot of weight gain and general unhealthiness. So, I decided enough was enough and took control of my life back by starting to run leading to completion of a marathon and in turn to triathlon and Fleet Feet’s Tri-201 course. That was 5 years ago and what I discovered across 2 Ironman’s and a half dozen half Ironman finishes is that I thoroughly enjoy all aspects of triathlon. For the last year I’ve been coaching local triathletes to achieve their goals and have obtained USAT level I and open water swimming coaching certifications. My goals for this season are to continue to improve as a coach, mentor, and triathlete with my goal race being Ironman Augusta 70.3. This is my 12th triathlon racing season! I love the sport and love the people more! I have made the best friendships in this sport while keeping a healthy lifestyle. For me, it is not always about time, but just enjoying the trip to the finish line. I've completed numerous 70.3s and a Full Ironman in 2018. Triathlon Certified Coach. I ran my first marathon in Berlin in 1986 and have completed over 10 marathons, the Goofy Challenge twice and the Army 10 miler over 20 times. After retiring from the Army after almost 30 years of service, I decided to join the Fleet Feet 70.3 training group for the personal challenge and to branch out from just running for exercise. I have since completed numerous triathlons including two 70.3 events and the Chattanooga Ironman this past September. The Fleet Feet training group provided me the coaching I needed to swim, bike and run and to also maintain my nutrition and stamina. I never thought I could do 70.3 miles or a full Ironman, but the Fleet Feet training programs provided me the training, mentorship and encouragement to accomplish things I never thought possible. If you have been looking for new challenges, come join the Fleet Feet training program. I am pretty new to running and triathlons. My first marathon was in January 2016. I hadn't even raced a 5k at that point and I was just trying to prove I could do it. I didn't train well and completed it with a time of 4 hours and 37 minutes. I then decided to actually train and signed up for Fleet Feet 201. I have been training with Fleet Feet ever since. I have progressively gotten much faster and race as often as I can. I won the Chattanooga Seven Brides Marathon in 2017, got 2nd OA at the 2018 Mississippi Blues Marathon, won the 2017 and 2018 Race the Station duathon, and got a new marathon PR of 2:47:29 this past December. I love the training groups. The accountability and friendships make the training much easier than going it alone. All the coaches have a wealth of knowledge and experience that they love sharing with the group. I hope that I can add what little I have learned and lend to the incredible training Fleet Feet offers! I grew up in Chattanooga, TN and went to UTC where I majored in Music Education. After getting married to Gil, I ended up in Savannah, GA teaching (imagine a long, convoluted story with lots of drama) and after too many years of too much stress and too little exercise I was ready for a change. A good friend encouraged me to start running in 2011 and I did my first 5K in December of that year. 2012 brought the purchase of a bike (the built-in breezes of riding was nice in the summer heat) and my introduction to the half marathon distance. At this point, the same good friend had started doing this crazy thing called triathlon and convinced me since I was already running and had a bike I should learn how to swim too. In January 2013 I joined her group of triathlete friends in the beginner lane of group swim training and signed up for my first Sprint Tri. Aside from panicking during the ocean swim of the race, my first triathlon experience was great and I was hooked! The people I'd met were fantastic and encouraging, and I loved the way the exercise made me feel. I've since completed multiple sprint, olympic, and HIM distance races and met too many wonderful people to count. Triathlon has returned a feeling of strength and confidence to me that was lacking before. I plan on swimming, biking, and running for many years to come! I began running 25 years ago prior to joining the US Army and have not stopped since. In 1997, while running on the beach in Melbourne, FL I injured my knee and had to undergo microfracture knee surgery. The orthopedic surgeon advised me that it was in my best interest to give up running. I tried other sports, like softball and volleyball but those just didn’t fill the void left from running. Against my Dr.’s advice I began running again a few years later. Due to the stress on the knee I could only run every other day. It took several years of slow progress to get back to full strength. I started participating in races about 6 years ago after my wife finished her first half marathon. She talked me into signing up for the Huntsville Sprint Triathlon. Half way thru the first lap of the swim I had to stop along the wall to catch my breath. I then had to stop at the end of each lap - it took me almost 15 minutes to complete the 400 meters. I absolutely hated it! Triathlon was too intense for me, so I went back to running. Over the next couple years I completed Rocket City Marathon twice and a couple of half marathons. Running was going fine but I needed a new challenge. As luck would have it, I was talked into signing up for TRI201 through Fleet Feet Huntsville. I was very apprehensive at first but I stuck with the training and began to enjoy the process and the races. I have been racing triathlons for four years now and have steadily improved. I've been running for fitness and recreation for nearly 30 years. I came from a cycling background a few years before that. I have tried to stay in shape over the decades with some success, but running alone hasn't quite done it. As much as I love to run, triathlon has brought me back to my love of cycling. Swimming, cycling, and running help round me out as an athlete and keeps me in shape for the long haul. I'm in my ninth triathlon season and I look forward to many more years of it. Fleet Feet training programs has been a big part of that, having met fellow athletes and made many friends. Their training programs really are wonderful. Ruth Marie Oliver is originally from Mississippi and completed her first triathlon in 1998 while in college at Delta State University. Fast forward to 2012, she committed to getting back into shape with three other friends while on a camping trip on the coldest weekend of the year. 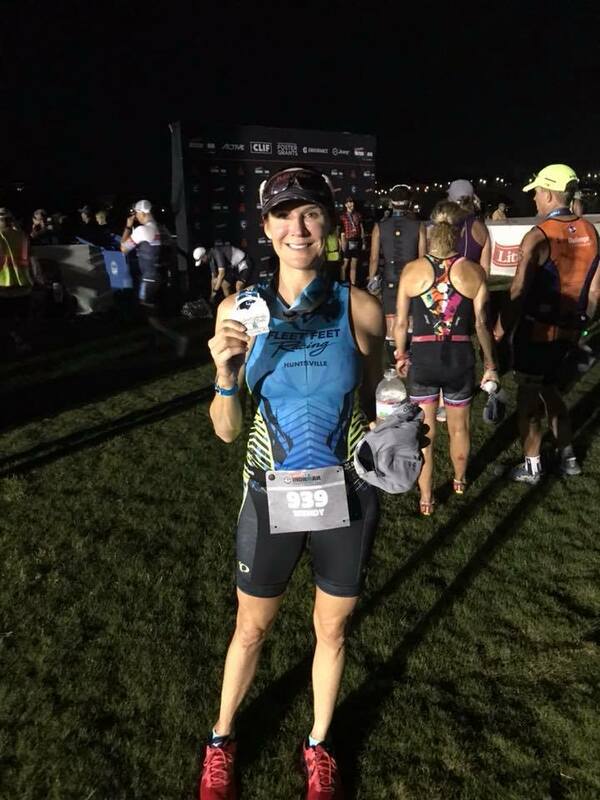 Being a recreational swimmer and completing exactly one 5K, Ruth Marie decided to buy a road bike and take up triathlon because being a triathlete just sounded cool. During the summer of 2012 she completed two sprint triathlons and a duathlon. In 2013, she completed her first Olympic Distance in May and Ironman 70.3 Augusta in September. Just over two years after her first triathlon since college, Ruth Marie finished Ironman Chattanooga with a time of 13:39:21. Now, she is a veteran of nine half distance triathlons and five Ironman. She continues to return to the longer distance races because of the challenge in training and planning for a long day on the course. She believes Ironman is just as much mental toughness and planning as it is physical training. I'm a born and raised Alabamian. I grew up in Hartselle and have lived in the North Alabama area all my life. I got my Bachelor's degree in Aerospace Engineering from UAH in 2002. I started running after I quit smoking in 2006 to keep from gaining weight. I trained for my first 5K (Cotton Row) in 2008 and I haven't stopped since. My triathlon career started when I friend of mine wanted to do the Huntsville Sprint Triathlon in 2008 but couldn't run because she was pregnant at the time. She asked me if we could do a relay - I would run, she would bike and swim. After that I was hooked. I decided to do one on my own so I signed up for the Frantic Frog triathlon that next month and came in next to last place. Then and there I decided that triathlon was where I was supposed to be and the season of 2009 was dedicated to improving and achieving competitive results. I did my first half Ironman in 2010 (Ironman 70.3 Florida) and my first Ironman in 2011 (Ironman Florida). Ran Cross Country and Track in High school but started running again as an adult in 2013 with the Fleet Feet NOBO classes my wife and I took. We progressed through Tri 101, 102, and I continued on with 201. Worked with some amazing coaches in all three disciplines (4 if you count the beer at the end!) and have been having fun since! Enjoy the sprint and Olympic distance triathlons, but have my eye on the longer races at some point. But with hiking (a trip to the Grand Canyon later this year is in the works for rim to rim to rim hike), offroading, and family out of town, finding the time to get it all done has kept those longer races at bay. Swimming has been my weak link, despite being a certified scuba diver (Man, I wish I could use fins, BC’s, and regulators in triathlon! ), but really enjoy the bike and am working on being stronger off the bike for a better run. Again, Fleet Feet’s programs have helped with the run performance and I can’t speak highly enough about them!